For oily, unbalanced and reactive Skin Instants®. 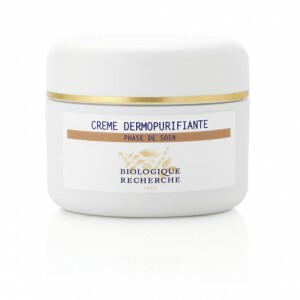 Micro-exfoliant agents: Meadowsweet Extract, Alpha Hydroxy Acids. Purifying agents: Thyme Extract, Biologique Recherche Specific Phyto-Complex, Yeast Extract. Seborrhea regulation agents: Vitamin B3, Bardane Extract, Enanthia Chlorantha + Oleanic Acid Complex. Astringent agents: Witch Hazel + St John’s Work complex, Milfoil, Horse Chestnut and Mimosa Extracts. Anti-inflammatory agents: Arnica, Centella Asiatica, and Cucumber Extracts. Regenerating and hydrating agents: Ascorbic Acid, Lavander Extract, Hyaluronic Acid, Silk Extract.